You know you should limit your intake of fat, sodium, sugar and many other ingredients. Checking the label of packaged food is a good place to start. The Food and Drug Administration – which regulates labeling – requires food labels to include information on trans-fats and allergens. Trans-fats, along with saturated fats and dietary cholesterol, are believed to raise the level of low-density lipoprotein (LDL) or “bad” cholesterol, which is considered a factor in the development of heart disease. Including information on trans-fats as well as saturated fats and cholesterol lets you make fully informed choices about the amount and type of fat in the foods you eat. Most trans-fat comes from animal fat or from adding hydrogen to vegetable oil. This hydrogenated fat increases the shelf life of products. Trans-fat is most often found in items like cookies, crackers, hard margarine, fried foods and snack foods. Labels also must list the presence of eight major allergen groups: peanuts, tree nuts, milk, eggs, fish, crustacean shellfish, soybeans and wheat. These eight major allergens account for about 90 percent of food allergies, according to the Food and Drug Administration. About 30,000 people a year require emergency treatment for food allergies, and about 150 people a year die from an allergic reaction to food. Before the FDA labeling requirements, determining whether a food contained an allergen could be difficult. For example, many foods contain casein, which is a protein derived from milk. Previously, some labels listed only casein as an ingredient, which might not protect milk-sensitive consumers who did not realize that casein is made from milk. Now labels must identify milk as an ingredient, as well as casein. Cholesterol, fat and saturated fat. Eating less of these, as well as less trans-fat, is important for people who are trying to control their cholesterol and weight. High cholesterol and excess weight are major risk factors for several conditions, including heart disease. Sodium. Sodium can increase blood pressure, so people who have high blood pressure or who are at risk for high blood pressure should try to keep their sodium intake below the recommended daily amount. Soups, pasta and rice side dish mixes and canned vegetables may have surprisingly high sodium content, although there may be lower-sodium options available. Sugar. People with diabetes or a family history of diabetes, as well as people with high or low blood sugar, should be especially aware of the sugar content of the food they eat. Calcium. This mineral builds strong bones and teeth. Growing children should be sure to get enough calcium, so that their bones and teeth develop properly. This is especially true for girls, because if they do not develop sufficient bone mass when they are young, they are at greater risk for osteoporosis after menopause. 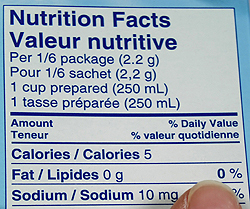 Finally, one of the most important pieces of information on a food label is serving size. Most diet experts agree that Americans not only eat too much unhealthy food, but they eat too much food, period. Super-sized restaurant portions have given many people an unrealistic idea of serving size. The label gives you a better idea of what experts consider a reasonable serving.